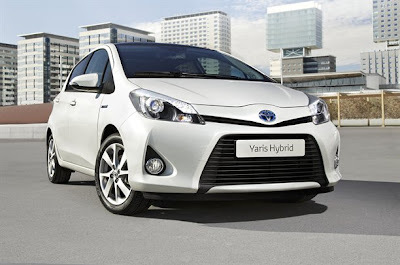 Toyota has released the first official images and details of its new Yaris Hybrid supermini, which debuts at the 2012 Geneva Motor Show in March and goes on sale in the UK this summer. The Yaris Hybrid uses a ‘downsized’ version of Toyota’s Hybrid Synergy Drive (HSD) powertrain. With a new 1.5-litre petrol engine and more compact electric components – including the motor and the battery pack – the HSD in the Yaris is 20% lighter than that fitted in the Toyota Auris Hybrid. All told the system produces 100hp, which should make for one brisk little car – especially given the electric motor will throw in a lump of instant torque. But Toyota hasn’t yet announced any top speed or 0-62mph acceleration figures. What the Japanese carmaker has said, however, is that Yaris Hybrid will offer a “segment-leading balance of performance and CO2 emissions”; we suspect this careful phrasing may have something to do with the 85g/km CO2 Kia Rio – even if the Yaris can’t match this for emissions it will almost certainly be faster. There are no mpg or other fuel economy claims at this stage, either, but the reduced sized of the HSD powertrain and some clever packaging – the battery pack and the fuel tank are under the rear seat – means the Yaris Hybrid retains all the passenger room and the 286-litre boot of the conventional version. Beyond some minor aerodynamic adjustment the Hybrid looks fairly conventional, too. Standard equipment will include an ‘e-CVT’ automatic gearbox and air conditioning, while Toyota is also promising the new car has been developed to be the most affordable hybrid in Europe. 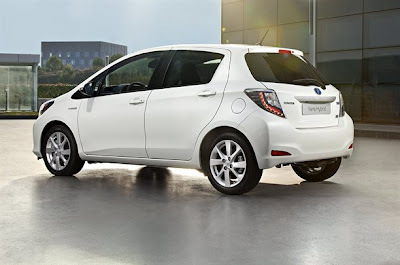 In order to achieve this goal it will have to cost less than the £15,995 entry-level price of the Honda Jazz Hybrid. All this and more should be confirmed closer to the 2012 Geneva show.